Clockwork study desk built by naturalist John Muir while at the University of Wisconsin, Madison, 1861-1863. 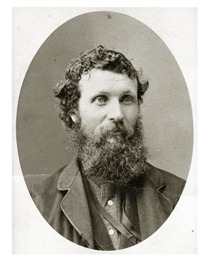 John Muir (1838-1914) was one of America's most influential conservationists. A naturalist, world traveler, and prolific writer, Muir was a champion of wilderness, who co-founded the Sierra Club in 1892, successfully lobbied for the expansion of national forests, and was instrumental in the creation of Yosemite, Sequoia, Mt. Rainier and Grand Canyon National Parks. As a young man, however, Muir also invented and built numerous mechanical devices, including this magnificent clockwork desk, made between 1861 and 1863 while he was a student at the University of Wisconsin in Madison. I invented a desk in which the books I had to study were arranged in order at the beginning of each term. I also made a bed which set me on my feet every morning at the hour determined on, and in dark winter mornings just as the bed set me on the floor it lighted a lamp. Then, after the minutes allowed for dressing had elapsed, a click was heard and the first book to be studied was pushed up from a rack below the top of the desk, thrown open, and allowed to remain there the number of minutes required. Then the machinery closed the book and allowed it to drop back into its stall, then moved the rack forward and threw up the next in order, and so on, all the day being divided according to the times of recitation, and time required and allotted to each study. In a roundabout way, Muir's mechanical creativity is what brought him to the University of Wisconsin in the first place. Born in Scotland, John Muir emigrated with his family in 1849, settling at Fountain Lake, near Portage, Wisconsin. When not performing the demanding physical labor required to establish a homestead on what was then the frontier, John found time to explore the oak woods, wetlands, and prairies of Marquette County. As a teenager, Muir developed a genius for mechanical invention, but his sternly religious father, Daniel, forbade him to waste work hours on such matters. Instead, John roused himself after midnight to work on his inventions in a cellar workshop lit by a single tallow candle. On the farm Muir constructed numerous devices including water-wheels, thermometers, hygrometers, clocks, automatic horse feeders, and an "early-rising machine," a device that dumped the sleeper out of bed at an appointed time – a boon to pre-dawn inventors everywhere. But Muir, whose schooling had ended when he left Scotland, craved formal education. Hoping to secure an industrial job that would pay enough for tuition at the University of Wisconsin – which he characterized as "next ... to the Kingdom of Heaven" – Muir took several of his inventions to the 1860 Wisconsin State Fair in Madison. These inventions, most notably a clock in the shape of Father Time's scythe, created a stir, and Muir scraped up enough cash to enter the University the following year. I was only leaving one University for another, the Wisconsin University for the University of the Wilderness. 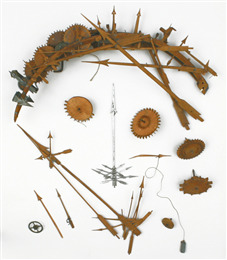 For the next several years Muir relied on his mechanical skill to make ends meet, working as an engineer and foreman at woodworking factories in Ontario and Indiana and conducting botanical studies in his spare time. An accident with a metal file in 1867 nearly blinded him, and the resulting weeks of sightlessness made Muir fully realize how important the beauties of Nature were to him. "I bade adieu to mechanical inventions," he wrote, "determined to devote the rest of my life to the study of the inventions of God." When he recovered, Muir began his "thousand mile walk" to the Gulf of Mexico, the first of his many journeys into America's wild regions. For the rest of his life, Muir served as a tireless advocate for preserving America's natural resources and wilderness areas. The contrast Muir draws between "mechanical inventions" and "the inventions of God," strikes true for many of us. 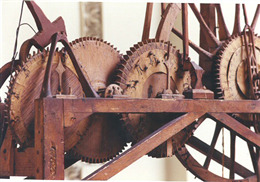 And yet, nature, spirituality, and machinery are not necessarily mutually exclusive. 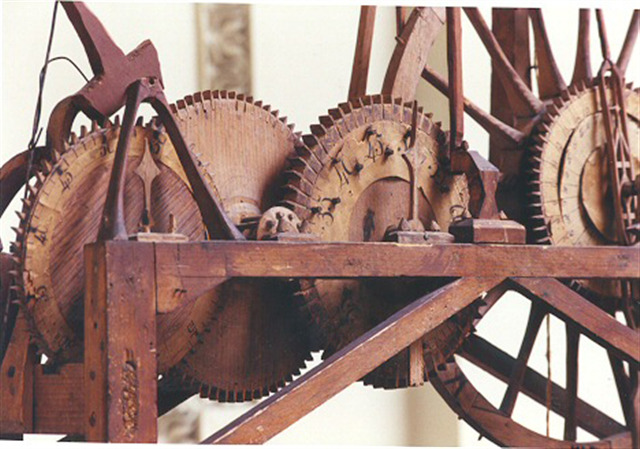 God has sometimes been described as a clockmaker, and in some ways the complex and balanced arrangement of gears, springs and escapements in a clock resembles the intricacies and interrelatedness of natural systems. This object demonstrates that one of America's greatest naturalists was also a mechanically gifted inventor. John Muir, whose passionate writings helped convince lawmakers and the American people that wild places have a spiritual value independent of their economic benefits, was in a fundamental way an engineer. His inventions are a potent reminder that human ingenuity - and the vision, knowledge, and ambition needed to create a machine like this amazing clockwork desk – are, indeed, profoundly natural phenomena.